Mark your calendars for Jazz Fest 2016: Sept 20th – Sept 25th! September sizzles with a six-day celebration of jazz in downtown White Plains beginning Tuesday, September 20th culminating in an outdoor Jazz & Food Festival on Mamaroneck Avenue with delicious food from area restaurants on Sunday, September 25th. Jazz Fest 2016 is presented in partnership by ArtsWestchester, The City of White Plains and the White Plains Business Improvement District. Press kick-off and opening reception. This event is free and open to the public. Space is limited to make your reservations TODAY! Downtown Music at Grace Church presents Music Conservatory of Westchester Jazz Faculty Ensemble in A Tribute to Michael Brecker. Enjoy The Westchester Conservatory of Music Jazz Faculty Quartet playing music composed by jazz saxophone legend and innovator Michael Brecker, a long-time resident of Hastings-on-Hudson, NY. Featuring: Rale Micic, guitar; Nicholas Biello, saxophone; John Lang, bass and Jake Robinson, drums. Downtown White Plains Jazz Stroll – music in three venues throughout the evening. Admission is Free at all venues, but tips to musicians and patronage at all venues is encouraged. The Westchester Conservatory of Music Jazz Faculty Quartet will be hosting a Jazz Workshop and Jam at the Music Conservatory of Westchester, Stadther Recital Hall, bringing jazz education to the Jazz Fest lineup. A workshop in jazz and improvisation will be presented, followed by a jam session for any interested players. 914.761.3900. The Gary Smulyan Organ Quartet pulls out all the stops at ArtsWestchester. Multi-award winning baritone saxophone master delivers a soulful jazz sound with Mike Ledonne, Hammond B3 Organ, Peter Bernstein, guitar and Joe Farnsworth, drums.For more information about the Gary Smulyan and the Quartet click here. White Plains Performing Arts Center presents LOUIS-and-ELLA! by Trent Armand Kendall. A musical tribute in concert to the great icons of Jazz, Louis Armstrong and Ella Fitzgerald. Featuring Trent Armand Kendall and Natasha Yvette Williams in the title roles.Admission: $29 ($25 for ArtsWestchester and WPBID members) at the WPPAC box office. 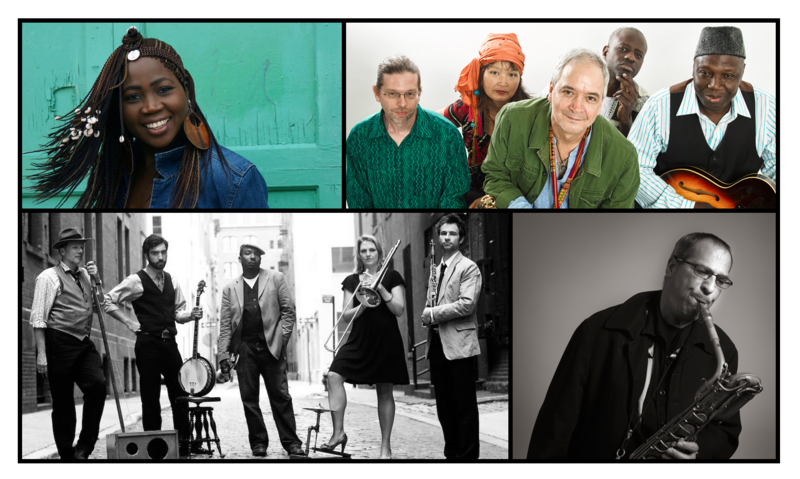 ArtsWestchester presents Source International African Jazz Band: a Global Sound in Jazz. Jazz returns to its roots with a vibrant and danceable mix of music of Guinea and Mali with a jazz inflection. Featuring Sylvain Leroux, tambin (fula flute) and sax and Abdoulaye Diabate, guitar and vocal.For more information about Source International African Jazz Band click here. The culminating day of Jazz Fest brings five sets of music spanning the range of the evolution of jazz from traditional Dixieland and swing to blues, Latin, smooth and African Jazz to the largest audience of the festival in an open air celebration of music and international foods in downtown White Plains. Baby Soda – Baby Soda is an adaptable and ever changing group with an eclectic set of influences ranging from 1930’s era swing and New Orleans jazz to early gospel and blues. The band has performed at some of New York’s finest venues, breathing the spirit and joy of the music into the present. Joe Boykin & Friends – Greenburgh’s own vocal favorite, Joe Boykin interprets classic vocal blues and jazz in his own unique deep baritone style, with James Farley, keyboard; Curtis Smithson, guitar; Butch Holland, bass; Art Bennett, Alto Sax and Flute; and Curt Jackson, drums. Mayra Casales – LP Artist, Cuban born percussionist has worked with top performers in both the Latin and jazz fields. Casales has founded both an all women’s salsa orchestra and performs with a Latin jazz ensemble. Bob Baldwin & Friends – Smooth Jazz Jazz Fest favorite and Mount Vernon native son presents his own blend of smooth jazz blend with Brazilian percussion and funk overtones. Awa Sangho – The “Golden Voice of Mali” brings the sound of the Sahara to Jazz Fest. Raised near Timbuktu, Awa is a veteran of the acclaimed Ensemble Koteba in the Ivory Coast who now lends her powerful voice from the heart of the musical traditions of Mali to a blend of African, Brazilian and jazz influences. As part of Jazz Fest 2016, The White Plains Library is collecting oral histories related to jazz in the City of White Plains. Leading up to this year’s festival the Library will feature a variety of stories on their web site. Listen to the first recording featuring Kenny Lee, whose life and music are important parts of White Plains history. Lee is known to different people for different things. Some know him as a trumpet player and band leader of the Kenny Lee All Stars. Find out more: http://whiteplainslibrary.org/2016/07/people-stories-oral-history-project-kenny-lee/ And, stay tuned for more oral histories inspired by the partnership between ArtsWestchester and The White Plains Library’s People & Stories Oral History Project.